Good morning, Friends! Once again I am lacking in my daily postings. I am still sewing away on Christmas gifts! My parents arrived yesterday to watch Nick play some basketball games this weekend! His birthday is on Tuesday (OMG - 14 years old) so there is a lot going on right now! But it's all good and I am happy to have at least my challenge cards posted for you all!! Today's Thursday challenge from the Create with Connie and Mary team is a sketch challenge! Take a look! 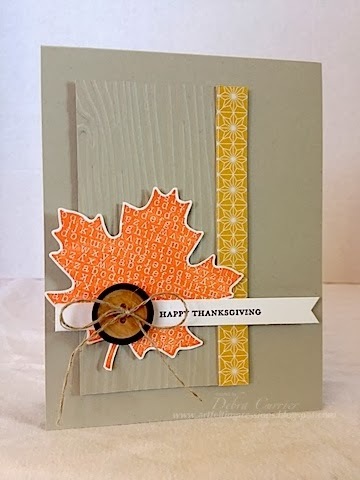 Pretty simple card but I love the pop of that orange against the neutral card stock! It really pops! Reminds me of the fall colors here in Colorado!! I hope you are inspired to play along with us this week! 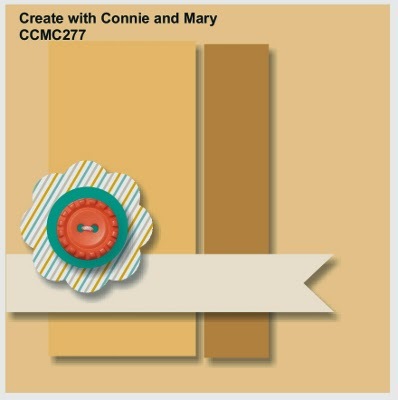 For more wonderful inspiration, be sure to check out the other creations at Create with Connie and Mary! Have you subscribed to the Create with Connie and Mary Winter Collection? We are on our last week of creations! But it's not too late to sign up and see ALL the wonderful projects and creations! You will get all the downloadable tutorials, too! Great ideas for the upcoming holidays! Thanks for stopping by and have a super day!! What an awesome little fall card! Love the big maple leaf! Love the monochromatic wood grain panel and the cute button. Great job! I agree with you about Thanksgiving being overlooked! It is my favorite holiday so I love your card. The button is a perfect addition. Gorgeous clean and simple card! Crisp looking, perfect for fall! What a gorgeous card. Your ability to do such beautiful cards with so few elements is truly a gift! I so admire that! This one is so striking!